Strengthening the faith and devotion to duty of musicians through spiritual advice is Bro. Eli’s chief concern to keep them committed. In this photo of the recent Music Summit, choristers go majestically vocal as they render a heartfelt song of praise to God for the talent and duty given to them. He said that choral singing is native to the people of God as in the early biblical times. The basis, Ecclesiastes 2:8, was read wherein King Solomon had men and women singers in his court. A similar verse, I Chronicles 23:5, recorded a four-thousand-strong who held instruments during the reign of King David. Their only duty was to offer praise to God. In addition, Bro. Daniel Razon, Vice-Presiding Minister to MCGI, taught the use of mnemonics to remember the list of virtues written in II Peter 1:5-8. These are the seven that should be added to one’s faith – virtue, knowledge, temperance, patience, godliness, brotherly kindness, and charity. The said mnemonics, which was rendered in Tagalog, was addressed to the members of the music ministry. 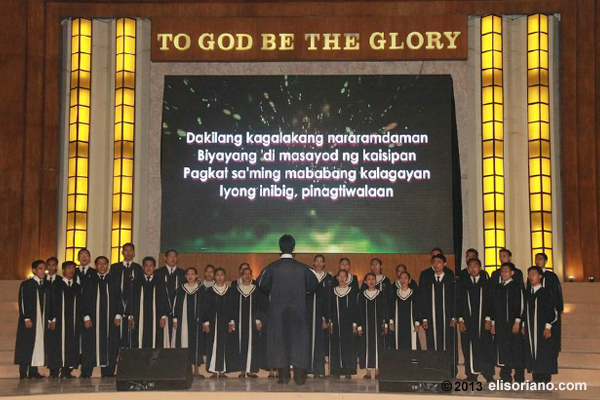 The Summit ended with the Music Ministry Core (MMC) singing the theme of this year’s event.